Description The version 5.0 Aquarius Level 2 product Cal product includes only the instrumental wiggle correction and is part of the official end of mission release of the orbital/swath data from AQUARIUS/SAC-D mission. The Aquarius Level 2 data set contains sea surface salinity (SSS) and wind speed data derived from 3 different radiometers and the onboard scatterometer. Included also in the Level 2 data are the horizontal and vertical brightness temperatures (TH and TV) for each radiometer, ancillary data, flags, converted telemetry and navigation data. Each data file covers one 98 minute orbit. The Aquarius instrument is onboard the AQUARIUS/SAC-D satellite, a collaborative effort between NASA and the Argentinian Space Agency Comision Nacional de Actividades Espaciales (CONAE). The instrument consists of three radiometers in push broom alignment at incidence angles of 29, 38, and 46 degrees incidence angles relative to the shadow side of the orbit. Footprints for the beams are: 76 km (along-track) x 94 km (cross-track), 84 km x 120 km and 96km x 156 km, yielding a total cross-track swath of 370 km. The radiometers measure brightness temperature at 1.413 GHz in their respective horizontal and vertical polarizations (TH and TV). A scatterometer operating at 1.26 GHz measures ocean backscatter in each footprint that is used for surface roughness corrections in the estimation of salinity. The scatterometer has an approximate 390km swath. Enhancements to the version 5.0 Level 2 data relative to v4.0 include: improvement of the salinity retrieval geophysical model for SST bias, estimates of SSS uncertainties (systematic and random components), and inclusion of a new spiciness variable. Description:	Launched in 2011 the 3 Aquarius radiometers meet very exacting requirements for low noise and calibration stability. This makes them about an order of magnitude more accurate than any radiometer ever used before for remote sensing of the earth. Aquarius measures in the microwave range at 1.413 GHz (+/- 25MHz). Description:	The Aquarius scatterometer is a total-power L-band (1.26 GHz)radar system for estimating ocean surface roughness. Itsmeasurements will enable the removal of wind effects from theAquarius radiometer ocean-surface brightness temperaturemeasurements being used to retrieve ocean salinity. 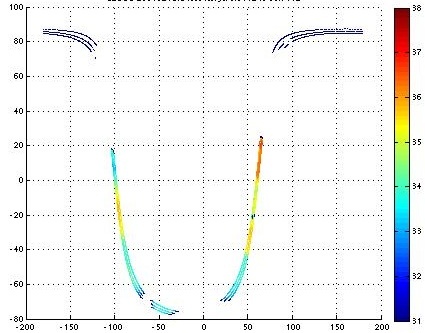 TheAquarius scatterometer is a relatively simple, low-spatialresolution power-detecting radar, without ranging capability.But to meet its science requirement, it must be very stable, withrepeatability on the order of 0.1 dB over several days, andcalibrated accuracy to this level over several months. Datafrom this instrument over land as well as ocean areas will beavailable for a variety of geophysical applications. Citation NASA Aquarius project. 2017. Aquarius Official Release Level 2 Sea Surface Salinity & Wind Speed Cal Data V5.0. Ver. 5.0. PO.DAAC,	CA,	USA. Dataset accessed [YYYY-MM-DD] at http://dx.doi.org/10.5067/AQR50-2IOCS.